Source Of Denial is one of the new Runescape achievements which is actually really easy to achieve and can be done in 1 minute. Basically you need to pick fruit from a Sq’irk tree in the Sorceress’s Garden without stopping and it awards 10 runescore points. One has to start right beyond the entrance gate and pick a fruit from the tree without stopping. Running is imperative, and it is done most easily in the winter garden. Source Of Denial – Pick fruit from a Sq’irk tree in the Sorceress’s Garden without stopping. 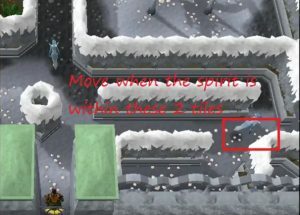 When you see the spirit click on the sq’irk tree and let your pixels do the running – as you near the tree click on it again so it picks it straight up. Sometimes you will get the message “someone’s actions have disqualified you from completing the source of denial achievement”. That is normally you, sometimes you can get through without the elementals firing off the teleport spell as you are behind a wall, so you can still pick the sq’irk but it will not count for the achievement. Just keep trying and you will get it eventually. The elemenatals can also get out of sync when they catch you or someone else so look out for that too when following the above guide. As of the 27th of june, Gielinor has another boss mob to face: Telos, the warden. This boss is unique in almost all of its attacks and special mechanics. Let’s cover the basics first. – Telos starts at 0% and is his enrage is uncapped; therefore being the hardest boss in game. – Telos drop mechanic is different; you can chain your loots for better loot, guaranteed better drops at higher enrage, and his enrage resets at every successful loot or when you meet your maker. – Telos rage increase is RANDOM by 5-25% per kill. You can reset rage or set to hardest you’ve unlocked. – Enhanced mage: Fireball. Uses this attack when his special bar is full. Doing magic attacks reduces this. – Uppercut: He will hold his attacks and then charge you. This can be dodged by surging to the left or the right. Surging into him will still make him deal a fair amount of damage to you. – Jump stun: Telos will say ‘hold still, invader’ and stun you before jumping up to deal you for a huge hit. Can be dodged by using freedom and walking/surging away. – Tendril stun: Telos will say ‘return to the ground’ and snares you in tendrils. This will damage you every tick and heals telos for 1500 hp per tick, as well as draining adrenaline every tick. Deal damage to end his grip (3000 at low enrage, more when higher). Can not be dodged in any other way. Telos’ jump and uppercut specials CAN be blocked with resonance. – Black beam: Decreases damage done and damage taken. – Red beam: Increases damage done and damage taken. – Minions: Make sure the minions are down as soon as possible as they increase telos’ defence or decrease your hitchance by a VERY significant amount. Minions spawn at 75k, 50k and 25k respectively and will continue to regain consciousness after a few seconds of getting knocked out. – Shockwaves: As long as the minions are killed as soon as possible you wont have to deal with these. Whenever the minions are alive they increase the bar on top of the screen. When it reaches the red, telos will send out shockwaves. – Minions: Kill these minions asap. – Dps telos down as quick as possible. Keep him away from the beams by blocking them or walking telos out of them. – Dps telos down as quick as possible. Keep him away from the beams by blocking them or walking telos out of them. Beams charge his adren bar; the higher his adren bar the more damage he does to you. – Dps telos down as quick as possible. Take the minions down as quick as possible. Minions spawn at 75, 50 and 25k. Keep him away from the red beams. – Stand in the pure anima font until he spawns his minions, target the minions and get back on telos. After telos used his anima bomb attack and it hit you, move to the vulcanic anima font and repeat the same thing. Move to the corrupted anima font after that and repeat. – Dreadnips poison, stall and stun him. – Dominion gloves stall him slightly as well. – The full fight should be easily soulsplittable on low enrage. – Telos drains your renewal timer and possibly your ovl timer as well. Seems to have an increased prayer drain rate. 13. Teleport to prif (lodestone). Do the tree patch in trahaern section then do the fruit tree patch in meilyr section.